Every day, your readers get way too much to read. In fact, according to a study by USC’s Annenberg School for Communication, your readers are bombarded with the data equivalent of 174 newspapers — ads included — every single day. In this environment, readers get through the day by skipping most of the messages they receive. In fact, each day, your readers select just a tiny sliver — a fraction — of all the incoming information. They say, “This, I’ll read.” And everything else goes into the trash. So how do they select that fraction? Think of Wilbur Schramm (1907-1987) as a Mad Man. He was a communication theorist during most of the 20th century, around the time David Ogilvy and others were starting to scientifically analyze what works and what doesn’t in writing. Godfather of communication studies and research: Wilbur Schramm created the Fraction of Selection model. Schramm created the first communication studies program, spread the field to universities across the country and trained the first generation of communication scholars. Which means that if you have a degree in communications, you are a direct descendant of Wilbur Schramm. He wrote 30 books during his lifetime. Your Communication 101 textbook was probably based on his Mass Media in Modern Society, which became the prototype for all Communication 101 textbooks. If you have a degree in Communications, you are a direct descendant of Wilbur Schramm. If you’ve ever had to memorize a model like “Sender > Receiver > Feedback > Interference,” blame Wilbur Schramm. He either created those models or reported them in his textbooks. The Fraction of Selection model answers the question: How do readers decide what to read? When you increase the gain, or reward, of reading, you’ll increase readership. When you reduce the pain, or effort required, of reading, you’ll increase readership. When you do both of these things at the same time, you’ll really dramatically increase readership. Information I can use to live my life better. Does your piece help readers make money, save money or get a Jennifer Lopez body while sitting on the couch eating Cheez Whiz from the jar with a spoon? That’s information they can use to live their lives better. Entertainment. Are you using creative techniques like human interest, metaphor or storytelling? Are you making your readers laugh, cry or shoot Diet Coke across the room from their noses? That’s entertainment. We have now exhausted all of the benefits of reading. That’s it. “Information I can use to live my life better” and entertainment are the only tools we have to draw readers into our message. Of course, you could always do both at the same time! But no matter how much you increase the reward of reading, your results get slashed by how hard it is to read. So to keep readers from running screaming from the room when they contemplate your message, you need to work both sides of Schramm’s equation. You must also reduce the effort required. How much does effort affect reading? Let’s say I’ve convinced you that if you read this message, you’ll be able to make $1 million by the end of the month — ethically, legally and morally. I’m guessing you’d read the piece: Some 99.97% of the audiences in my writing workshops say they would. But what if I told you that this message is 6,000 pages long, presented in one-point type — Shakespearian Gothic font. It’s black type on a 98% black screen. No leading. The entire 6,000 pages is one-sentence long, and there isn’t a word in here that has fewer than 14 syllables. What would you read for $1 million? A 6,000-page sentence with 14-syllable words in Shakespearian Gothic font? Me neither. Would you still try? In my classes, we lose between 75% and 95% of our readers when they learn of the huge effort required to read the piece. And this with a reward — a million bucks! — that’s so huge, few of us will ever be able to offer it. So we need to work both sides of Schramm’s equation: Reduce the effort as well as increasing the reward. 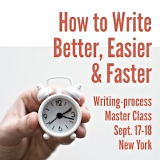 So Cut Through the Clutter: Make every piece you write easier to read and understand. And Lift Ideas Off the Screen: Help audience members get your key ideas by skimming, not reading, your message. This guy knew what he was talking about. Listen to him. Please share how you use Schramm’s formula in your messages in the comments section. 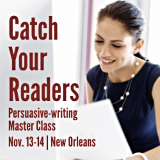 Learn a four-step process for moving readers to act by giving them what they really want at our Catch Your Readers Master Class on Oct. 2-3 in Dallas.